Along with Vernor Panton, Arne Vodder was a leading light of what might be called the “second generation” of forward-thinking 20th-century Danish furniture designers — those who, following in the footsteps of Hans Wegner, Arne Jacobsen, Finn Juhl and others, first applied the skills, traditions and philosophical tenets of Danish craftsmanship to a modern furniture idiom. 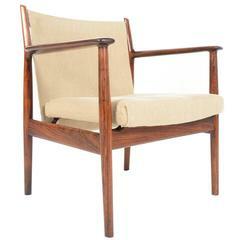 As a graduate student in architecture trained by Finn Juhl, Vodder made his mark in the 1960s, when modern design had gained wide acceptance, particularly in the business world. Accordingly, many of Vodder’s chairs are quiet in form — projecting an air of sturdiness and strength, rather than avant-garde styling. Vodder’s aesthetic flair was very pronounced in his cabinets and storage pieces — sideboards, bookcases, credenzas and buffets. In such pieces, Vodder liked to play with asymmetry. His bookcases often have a seemingly random array of variously sized shelves and nooks. A typical Vodder sideboard might have four sections, each different in purpose and look: an open stack of vertical shelves, and other cupboards covered with sliding panels in contrasting colored laminates and wood veneers. As you will see from the works on these pages, Arne Vodder had a sense of what kind of design was appropriate for which space: sobriety in the boardroom; playfulness at home. 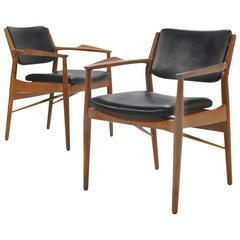 Arne Vodder model 418 armchairs made in rosewood. 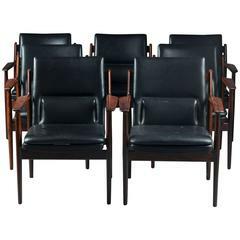 New upholstered with cognac aniline leather. Made by Sibast.